In this distro Chromium "settings" page is blank. Can someone confirm, and is there a solution? Hi Mikker, i'm new with tinkerboard, but i'm familiar with RasPi & Linux-mainly debian & clones *buntu..., but for some reason I'm unable to run your image - it looks fine (for some reason I'm unable to start kodi on mine) so I was hoping this will help... 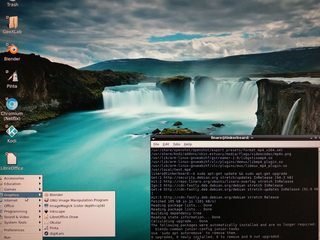 I'm getting bootloop - when x starts my monitorshows 1920 resolution then it changs to 800x600 then again 1920... any suggestions? But it seems like I cannot get Netflix to play back HD material in the browser, despite the settings I use on my Netflix profile - is this a known limiation? And are you planning on updating to the newly released TinkerOS 1.9? (07-27-2017, 08:11 PM)Eiertschik Wrote: Great image! Also, sometimes when I watch a video, it'll start out in low quality but will pick up to HD in about 10 seconds. That's normal. Also, Mikerr how are you making this custom image? Are you just installing everything on a fresh image and making a .img from the sd card in your PC? I need to do that for mine if so, but I don't know the commands. If you're using Windows, then nvmd :p I have linux. My internet connection speed is 30Mbps and the Tinkerboard is connected using 100M LAN.